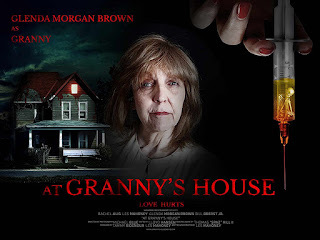 From playing Angel’s mother on the hit Buffy spin-off to playing victim to the deadly Rachel Alig in new horror flick At Granny’s House, there’s no denying Glenda Morgan Brown’s versatility. Congratulations on all the success you’ve had with At Granny’s House. How long have you been on that train for? When did it begin filming? Is the film that’s currently on VOD the one you set out to do? Is it the full vision come to life? That’s more a question for Les (Mahoney, the writer/director/star). As far as my little corner of the world, I would say I’m very pleased with the finished product, especially considering the whole production was done on such a shoestring budget. Altogether, I believe it was just three weeks. Compared to some of your other roles, how did this compare? I have had some larger leads in theatre, but Marion, aka “Granny”, is definitely the biggest role I’ve had in either film or television. Are you at grandmother in real life or did you have to improvise a little there? I actually am a grandmother to the most beautiful, talented, adorable little girl in the whole world! Biased, you say? Pshaw! Her name is Fiona Iris (Iris is my mum’s name). What have you seen filmwise lately that you’ve really enjoyed? Ironically, I don’t see that many movies (I’m a TV gal at heart), but my husband and I both enjoyed THE POST, WONDER WOMAN, and THE SHAPE OF WATER—we thought that one was absolutely magical!